When I used to stop cycling during the winter I’d always keenly anticipate the first ride in spring. Getting back on the bike after the winter hiatus was always exhilarating. Now that I cycle year round I miss having that first ride. On the other hand, I now get to look forward to the first ride of the year when I don’t have to use the winter bike. For the past few years my bike of choice for that ride was the 2008 Kona Jake CX bike, a happy blend of road bike and mountain bike. It’s a good choice for spring riding: zippy and rugged. I can confidently state that I will uphold the rules of the society. I have two 3-speed bikes and have ridden many kilometers on them, both commuting and for the pure enjoyment of the ride. Readers of this blog may recall not only the Raleigh 20 already mentioned above, but also the 1965 CCM Continental. Both bikes are equipped with the Sturmey-Archer internally geared hubs that seem to tick along reliably doing their job for decades. I picked up the R20 last year and spent some time in the early summer getting it road worthy and set up to my satisfaction. You can see my blog post showing its original condition here. Through the later part of the summer and early fall I put at least 500 km on the bike a lot of fun doing so. The R20 had a number of peculiarities to consider when setting it up. The bottom bracket is of unusual dimensions and requires heroic measures if you wish to set it up to accept a modern square taper crankset. Although I have access to the tools to do this job I decided leave it unchanged as the original crankset was in perfect condition and featured a nifty heron design on the chainring. Unfortunately, this means having to deal with the crank cotters whenever I want to service the bottom bracket. Completing that chore for the first time was tough as one of the cotters was well seized in place and pretty mangled by the time I removed it. The R20 has an unusual headset, a sort of combination of a threaded and threadless headset. It also lacks top ball bearings and instead has a plastic bushing. I had read that this results in stiffer steering,perhaps a deliberate choice of the designers who may have wanted to dampen the quick steering associated with many folding bikes. When I first tried the bike I found the steering to be unpleasantly stiff. There is modification that you can do to replace the original headset with a 1″ threadless headset, resulting in better steering. Before going to this extreme I tried simply greasing the bushing and lower ball bearings and correctly setting the compression. 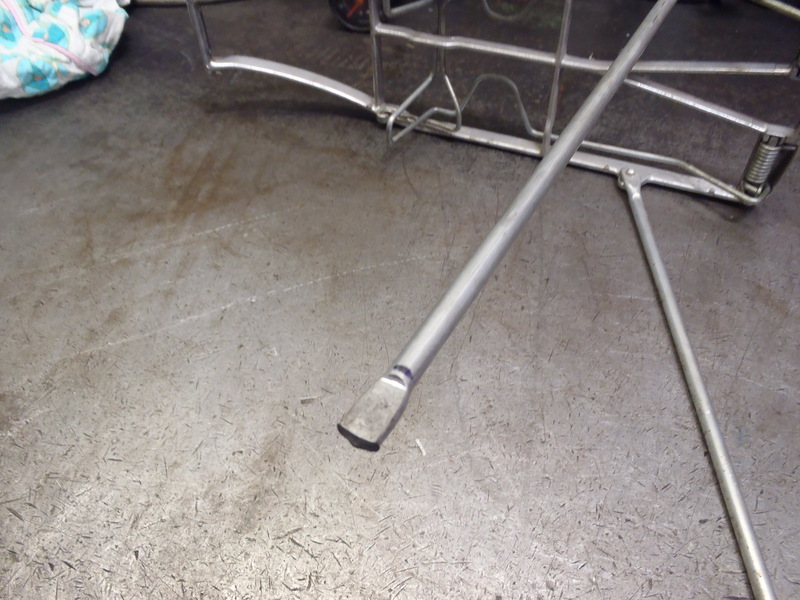 Afterwards,I found the steering to be much easier: quick and responsive. For my purposes, no headset modification was required. The one major change I made was to replace the steel rims with alloy rims. This is a good upgrade for old bikes, resulting in a lighter wheelset and better braking. I ordered the replacement rims from ebay and laced them onto the original hubs. I used Sun CR18 presta rims and drilled out the valve hole to accept schraeder tubes. After buying the bike and paying for the rims I was feeling a little cheap so I reused the old spokes. This is generally considered a bad practice but in this case the old galvanized spokes seem to be holding up just fine so far. They were a bit too long for the new rim,but a few minutes with a die-grinder shortened them adequately. I also made a number of smaller changes to the bike. The original saddle was horrible, so last year I replaced it with a salvaged foamy “comfort” saddle. This was OK, but today I swapped that one for a Brooks B66S that I picked up back in December via a Kijiji ad. Much classier and quite comfortable so far. I also replaced the tires today. The original tires were beyond use and the only replacements I could find at Bikeworks at first were a set of grey wheelchair tires.These were in pretty doubtful shape themselves,with the wire bead showing through the cracking rubber at several points. I rode these tires for hundreds of kilometers last year and though they let me get the bike on the road, I was always aware that they could fail at any time. The tires I put on today are NOS tires that I discussed in this blog post. They are in excellent condition and I like he looks of the black tires on the bike more than the grey ones. I added a rack to the bike. I used an old Pletscher rack that I had on hand. A small modification was necessary as the rack was made for a larger wheeled bike and so I had to shorten the stays. I cut them to the correct length and pressed new flats on them using the hydraulic press at work. Then I drilled new holes and was it was ready to install. Pletscher racks aren’t suitable for carrying a lot of weight but I have used this one on successfully on numerous grocery runs so far. All in all, the bike has shaped up nicely. The brakes still need some attention as the stopping power is less than great. I almost ordered some Tektro dual pivot long reach calipers but decided that I will first try a few more basic measures first like replacing the cable housing and cables. Eventually. In the meantime, I’ll still keep racking up the kilometers on this trusty ol’ 3-speed folder.. 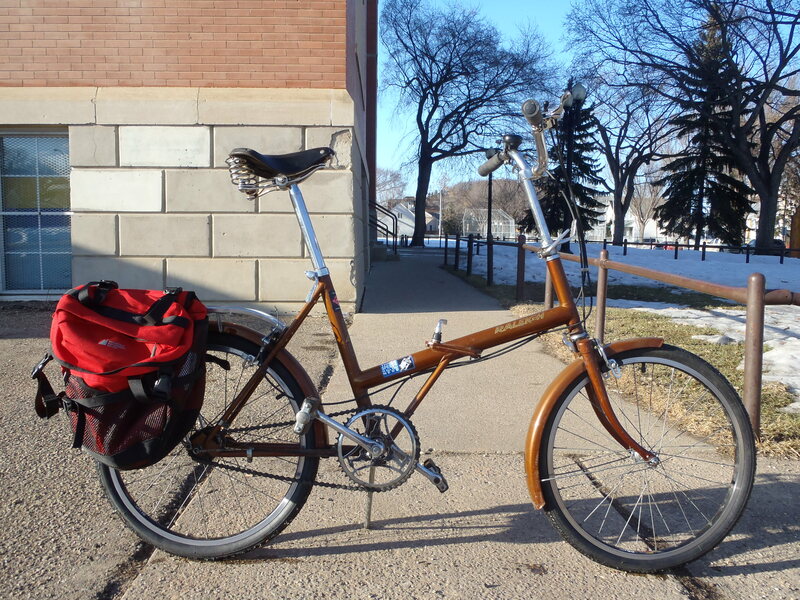 This entry was posted in Bike Repair, Classic & Vintage Bikes, commuting, Cycling, Spring Cycling and tagged Bicycle, Bike, bike repair, cycling, Edmonton, folding bike, Raleigh 20, vintage by tuckamoredew. Bookmark the permalink. Tuckamoredew (member no. 23) gives the Society some blog love and talks about the modifications he’s made to his sweet Raleigh 20. A handsome machine and a worthy society. Although I do not own a three-speed, I rented one last year while in Boston on business and was very pleased with its ability to take me on a thirty mile journey over varied terrain. Thanks! Although not suitable for all applications three speeds have a charming simplicity that I enjoy. When young, I rode a three speed Sturmey-Archer not by choice but because that was all there was on any bike that my parents would buy me or that I could afford. As the bike was also very heavy, this led to quite a bit of walking up hills as I was not a serious cyclist then. I couldn’t have been more pleased when I got the opportunity to upgrade to a five speed dérailleur and pedal up hills. When more gears became available I embraced them with joy . I have acquired an 8 speed hub gear on my latest bike and I miss the 14 of my previous hub. These days I would look on the three speed much in the same way as I would regard a fountain pen. Lovely things to have at the time but superseded by more easily used and convenient technology. Perhaps I can interest you in my latest idea (conceived upon reading your comment): clipless cycling clogs. They would definitely have the rigid soles required for cycling shoes and the cleats could be easily attached with wood screws. I’ll start whittling immediately. Rule #2 of The Society of Three Speeds requires that I “not permit others to disparage these humble bicycles”. Many of the arguments that I would put forward in favour of 3-speeds are actually arguments for internally geared hubs. You, as a former Rholoff user already know the merits of IGHs vs derailleur systems. Obviously, the performance of a 3-speed hub with a gear range of ~180% cannot compare to 14-speed with a gear range of 526%. On the other hand there is also no comparison in price: the rohloff is extremely expensive. My 3-speed R20 was one of my favourite bikes for zipping around the city last year and I didn’t find the reduced gear range to be a problem. Admittedly, I live in a very flat city (but with very steep hills in and out of the river valley). I have also used a nexus 8-speed hub and prefer the vintage 3-speed. This is primarily because the 3-speed is oil lubricated and seems to turn with less resistance than the grease lubricated nexus. Only the very high end modern IGHs are oil lubricated. One final point. 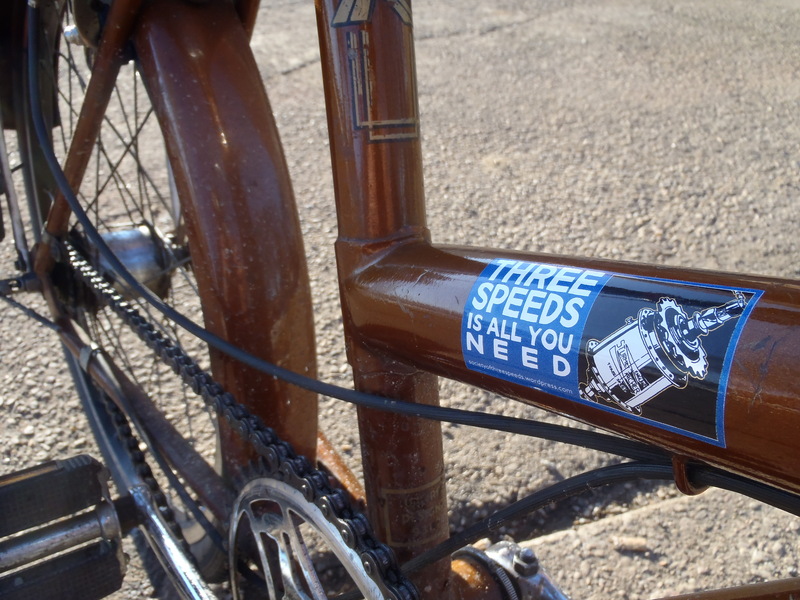 Vintage 3-speed hubs have proved their reliability through decades of service. In the rare case of a malfunction they are simple enough for someone with a modicum of mechanical aptitude to repair. Economy, reliability and modestly good performance. It could be my personal motto. I am suitably chastened. I look forward to the bike clogs.